Fulmars are seabirds of the family Procellariidae. The family consists of two extant species that are living and two that are extinct. 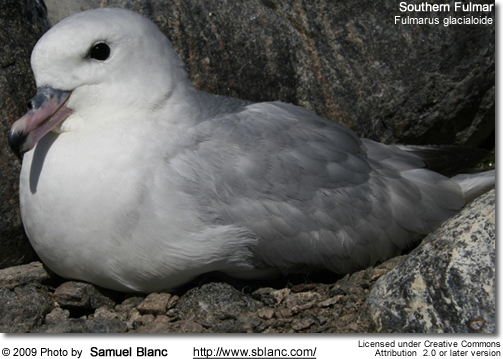 The two Fulmars are closely related seabirds occupying the same niche in different oceans. 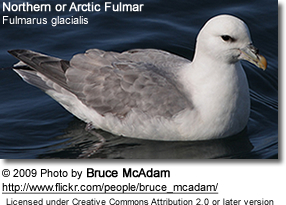 the Southern Fulmar, F. glacialoides, is, as its name implies, a bird of the southern oceans. These birds look superficially like gulls, but are unrelated, and are in fact petrels. The northern species is grey and white with a yellow bill, 43–52 cm (17–20 in) in length with a 102–112 cm (40–44 in) wingspan. 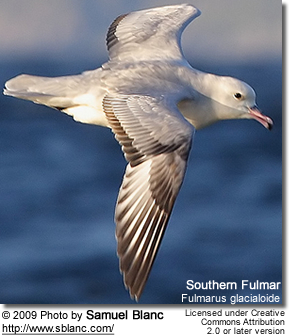 The southern form is a paler bird with dark wing tips, 45–50 cm (18–20 in) long, with a 115–120 cm (45–47 in) wingspan. Both recent species breed on cliffs, laying a single white egg. Unlike many small to medium birds in the Procellariiformes, they are neither nocturnal breeders, nor do they use burrows; their eggs are laid on the bare rock or in shallow depressions lined with plant material. Northern Fulmars historically bred on St. Kilda, and spread into northern Scotland in the 19th century, and to the rest of the United Kingdom by 1930. For example, establishment of colonies at the Fowlsheugh Reserve in Scotland was one of the first areas to be developed for new permanent Fulmar breeding areas. They are highly pelagic (open sea) outside the breeding season, like most tubenoses, feeding on fish, oil or offal (= entrails and internal organs of butchered animals). Recent studies in the North Sea have shown them especially susceptible to plastic discards. The range of these species increased greatly last century due to the availability of fish offal from commercial fleets, but may contract because of less food from this source and climatic change. The population increase has been especially notable in the British Isles. As members of Procellaridae and then the order Procellariiformes, they share certain traits. First, they have nasal passages that attach to the upper bill called naricorns. Although the nostrils on the Albatross are on the sides of the bill. The bills of Procellariiformes are also unique in that they are split into between 7 and 9 horny plates. Finally, they produce a stomach oil made up of wax esters and triglycerides that is stored in the proventriculus (stomach). This is used against predators as well as an energy rich food source for chicks and for the adults during their long flights. It will matt the plumage of avian predators, and can lead to their death. They also have a salt gland that is situated above the nasal passage and helps desalinate their bodies, due to the high amount of ocean water that they imbibe. It excretes a high saline solution from their nose. Two prehistoric species have been described from fossil bones found on the Pacific coast of California: Fulmarus miocaenus from the Middle and Fulmarus hammeri from the Late Miocene. 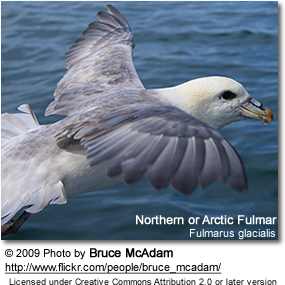 The genus name Fulmarus is derived from the Old Norse word full meaning foul, and mar meaning gull. This foul-gull is in reference to their stomach oil. Bull, John; Farrand Jr., John (June 1993) . "Open Ocean". in Opper, Jane. The Audubon Society Field Guide to North American Birds. The Audubon Society Field Guide Series. Birds (Eastern Region) (First ed.). New York, NY: Alfred A. Knopf. p. 314. ISBN 0 394 41405 5. Ehrlich, Paul R.; Dobkin, David, S.; Wheye, Darryl (1988). The Birders Handbook (First ed.). New York, NY: Simon and Schuster. p. 14. ISBN 0 671 65989 8. Gotch, A. F. (1995) . "Albatrosses, Fulmars, Shearwaters, and Petrels". Latin Names Explained A Guide to the Scientific Classifications of Reptiles, Birds and Mammals. New York, NY: Facts on File. pp. 191—192. ISBN 0 8160 3377 3.